In the 1965 season, the Lotus 33 and Clark returned to form on the Grand Prix circuits with a dominance that compares favorably with the best Formula One car/driver combinations of all time: Ascari and Ferrari in the early 1950's, Fangio in the Mercedes-Benz W196's in the mid-1950's, and Senna and Prost in the McLaren MP 4/4-Honda of 1988. Even the McLaren-Mercedes juggernaut of the late 1990's could not hold a candle to the performance of Lotus in 1965. Uniquely, Jim Clark in 1965 won not only the World Championship but also the Indianapolis 500. While other drivers have won both titles at some point in their careers, none have done it in the same year as did Clark. It is difficult to overstate this achievement: of the 10 Championship Grands Prix held in 1965, Clark participated in 9 (forsaking Monaco on May 30th 1965, in favor of Indianapolis on May 31st 1965), and won 6 of them. To put this accomplishment in modern terms, it would be as if Michael Schumacher and Ferrari won 11 of the 17 Grands Prix and the Indianapolis 500 in a given year. Again Clark and Gurney were teammates at Indianapolis for the 1965 Indy 500 but in the Grands Prix the titanic struggles between them - or between anyone and Clark - were few and far between in 1965: no one could keep up with Clark unless he suffered a mechanical problem, as he did at Monza, Watkins Glen and Mexico City. A statistic illustrates the point: Clark qualified no lower than second in the Grands Prix that year and was on pole and set fastest lap for 6 of the 9 Grands Prix he ran. Gurney and Clark did have one spirited battle early in the season on March 13th 1965, at Brands Hatch for the non-Championship Daily Mail Race of Champions, which was run in two heats. In Heat One, Gurney in a Brabham BT11-Climax and on Goodyear tires harried Clark's Lotus 33 on Dunlops to finish second, with both men setting an identical fastest lap! In Heat Two, Gurney started on the front row with Clark and continued his relentless pursuit of the Scot to the point that Clark slid off the track at Bottom Bend on lap 12, getting two wheels on the grass, clipping a marshal's post and cramming into the earthen bank so hard that the monocoque was damaged and had to be written off. (Typically for Clark, when the Lotus mechanics went out to recover the damaged Lotus 33, Jim Clark was right there with them to help put things right.) 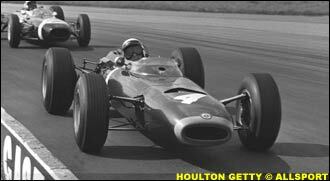 Once Clark was out, Gurney then took over the lead until he had engine trouble. Ultimately neither man won, the victory going to Mike Spence, Clark's teammate at Lotus. But the dicing with Clark seen in the Race of Champions was the exception not the rule in 1965. The South Africa Grand Prix in East London on January 1st 1965 established the pattern for the year. Clark was on pole, led flag-to-flag and set fastest lap, winning by 30 seconds over Surtees in the Ferrari 158. Clark and Gurney skipped Monaco so they could run in the Indy 500 which was on the same weekend; in their absence, Graham Hill took his third victory at Monaco but not without difficulty. At one point, Hill took evasive action at the chicane on lap 24 of 100 laps to avoid someone else's accident and ended up on the escape road near the chicane, car still running. Hill calmly got out of the BRM and left it in neutral gear, pushed it back onto the racetrack, got back in, rejoined the race, stormed through the field and ultimately nudged Bandini's Ferrari out of the way and won the race. Meanwhile, across the Atlantic, the Lotus-Fords, Clark and Gurney were having it all their own way in the 1965 Indy 500. 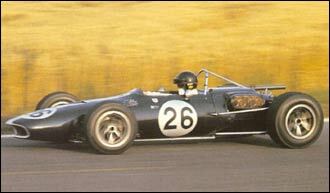 Both Clark and Gurney had qualified on the front row in the Lotus-Ford 38's, although pole position went to A.J. Foyt who was driving last year's Lotus-Ford 34, a chassis that had been a spare for Clark and Gurney at the 1964 Indy 500. Foyt went all out to take pole away from Clark during qualifying, driving his year-old Lotus down into the Danger Zone below the white line in the turns, the so-called "apron", in order to sustain his cornering speeds. And it worked for Foyt but even Jim Clark stayed above the white line that year. Lotus-Ford proved, however, that it had learned a thing or two about racing at Indy after three years of trying: in the pits for Lotus was the famed Wood Brothers NASCAR pit crew and in 1965 the Lotuses were on Firestone tires - Ford was taking no chances. Another American Grand Prix driver had joined Clark and Gurney as an entrant for the 1965 Indy 500: Masten Gregory, who qualified way back in the last row in 31st position was entered to drive the turquoise blue and white George Bryant Racing Projects BRP-Ford. Masten Gregory was in what would turn out to be his last of eight seasons in Grand Prix cars, racing a BRM periodically for about half the 1965 Grand Prix season. But despite the paucity of good finishes in his career, the Grand Prix drivers knew the bespeckled Gregory was one of the best and Jim Clark in particular regarded the slightly older Gregory as one of his heroes and had been thrilled to share a Tojeiro-Jaguar sportscar ride with Gregory early in Clark's career in the 1959 Goodwood Tourist Trophy race. Indeed, Gregory and Jochen Rindt were to win LeMans in 1965 in a Ferrari 275LM. And in the 1965 Indy 500, a few weeks before LeMans, Gregory showed the form of a winner when he somehow managed to pass 14 cars in the opening laps of the race, ultimately working his way up to fifth place before going out with engine problems on lap 59. It was Gregory's only Indy 500 and he finished in 23rd place. Turning to the principal protagonists of the 1965 Indy 500, Clark and Foyt put on the expected good fight and battled from the drop of the green flag, Clark taking lap 1 and Foyt fighting back to take the lead on lap 2, with Clark tucked in behind Foyt, and Gurney behind Clark. On lap 3, Clark reasserted himself and took back the lead and, in the end, led all but 10 of the 200 laps, winning by almost 2 minutes over second place Parnelli Jones, at a record speed of 150.686 mph, in a race that took just 3 hours and 19 minutes. How many firsts did Clark's 1965 Indy 500 victory achieve? His Lotus-Ford was the first rear-engined and first Ford-engined car to win the Indy 500 (nothing but Offenhauser's had won since 1946); and Clark was the first foreign born driver to win the Indy 500 since Dario Resta and his Peugeot won back in 1916. Clark was 29 years old when he won the Indy 500; the winners purse was $166,621, a large amount of money by Grand Prix standards of the time; indeed Clark's share as a driver (about $130,000) was over three times what he received for his entire Formula One season, which was about $37,600. Unfortunately, Gurney could not back up his superb qualifying run and was out of the race by lap 42 with a timing problem; A.J. Foyt also faded by lap 115, when he went out of the race with a damaged gearbox. Back in Europe, Jimmy Clark continued where he had left off in South Africa, winning the next five Grands Prix: the Belgian (a wet race and Clark's fourth consecutive Spa win, with only fellow Scot Jackie Stewart able to stay on the same lap as Jimmy) the French (Clark drove his old Lotus 25 to a win, Jackie Stewart having led at the outset of the race), the British (Clark led throughout, keeping Hill at bay while Clark nursed an oil surge problem in the closing laps), the Dutch (after Honda led the first 2 laps, Graham Hill's BRM P261 took over for 3 laps then Clark led the rest of the way), and the German (title clinching victory on the Nurburgring track where Clark led all 15 laps of the 14.17 mile circuit). The Italian, United States and Mexican Grands Prix were academic from Clark's standpoint after he won the Championship and that turned out to be a good thing since Clark retired from the Monza race (where fellow Scot Jackie Stewart won his first race) with a broken fuel pump and had engine trouble and went out early in both the U.S. and Mexico Grands Prix. Fittingly, in the last race of the 1.5 litre formula at Mexico City, Richie Ginther and the V12 Honda finally won a race: a first for Honda, for Ginther and for the American Goodyear tires. American Dan Gurney also showed well in Mexico and at Watkins Glen, finishing second in both races and finishing fourth overall in the Drivers' standings. The 1966 season caught many teams unprepared for the transition from the 1.5 litre that had prevailed since 1961 to the new 3 litre formula. Coventry-Climax had withdrawn from racing so the British teams tried a variety of approaches to fill the gap: BRM developed its powerful but heavy and troublesome 16-cylinder BRM H16. Lotus got along by using the old 1.5 litre V8 Climax engines bored out to 2 litres. Cooper was now affiliated with the Chipstead Motor Group which imported Maserati road cars so the 2.5 litre V12 engine used was a fuel injected derivative of that used (unsuccessfully) in the 1957-era Maserati. Jack Brabham had Repco, an Australian spare parts distributor, develop a light alloy V-8 based upon a General Motors stock block shared by Buick, Oldsmobile and Pontiac. As in the prior formula change in 1961, Ferrari was ready for the 3 litre formula, having developed a new 3.0 litre flat 12. Bruce McLaren and Dan Gurney became constructors with McLaren usually relying either on a modified Indy Ford V8 or a Serenissima V8 in a chassis designed by Robin Herd, later one of the founders of Grand Prix and Indy Car Constructor March. Gurney's new All American Racers organization, which Gurney founded with Carrol Shelby, fielded a new car called the Eagle, which ran an old 2.5 litre 4 cylinder Climax until the new Weslake V12 engine Gurney had commissioned was ready. Although regarded as an American team because the car was designed, constructed and assembled in Santa Ana, California, it must be acknowledged that the monocoque chassis and elegant body was designed by Englishman Len Terry, formerly of Lotus, and the equally gorgeous Weslake V12, resplendent with its multiple chrome exhaust pipes was built for Eagle in Rye, Sussex, designed by Aubrey Wood of Harry Weslake's company. Interestingly, at least one person with Gurney's Eagle team in this era is still in Formula One. Joaquin "Jo" Ramirez, originally from Mexico, who now helps Ron Dennis run the McLaren-Mercedes team as its Team Coordinator, started off as a mechanic with All American Racers. Honda was still readying its 3.0 litre V12 as the 1966 season began. To round out the variables of the new 3.0 litre formula, Firestone joined Dunlop and Goodyear as a tire supplier to Formula One. With this much in the way of changes in the air, 1966 proved to be a difficult year for the underprepared teams like Lotus and the newcomers like Eagle. 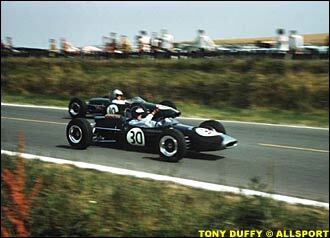 As a consequence, both Clark and Gurney had abysmal finishing records. 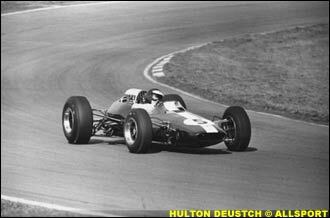 Indeed, Clark effectively turned his dominating 1965 season upside down in 1966, his Lotus 43 not finishing in 6 of the races and winning only once, at Watkins Glen for the U.S. Grand Prix, the only victory ever for the notoriously unreliable BRM H16. Gurney had the inevitable teething experience with the Eagle, going out in about half the races with mechanical difficulties, his highest finish of the year being fifth. Although the 1966 season was not especially significant for Clark and Gurney, it was a noteworthy season in other respects. The movie Grand Prix was being filmed during the season with Phil Hill driving a fake Formula One car in certain races and Carrol Shelby pitching in by building a special Ford GT40 to use as a camera car to keep up with the Formula One cars. Enzo Ferrari also made a contribution to the verisimilitude of the film by agreeing to open the doors to the factory at Maranello to director John Frankenheimer after being shown the footage taken at the 1966 Monaco Grand Prix. 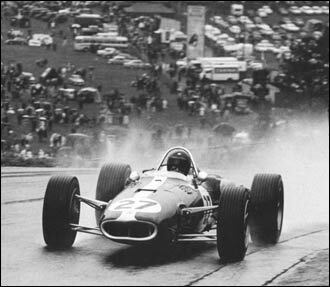 The 1966 season was also notable for torrential rains at Spa which deluged the track in the opening laps (captured on film in Grand Prix), sending cars careening off the circuit, including Jackie Stewart's BRM. Stewart broke his collarbone in the crash and was forced to wait 20 minutes to be rescued from his car, then still full of fuel, because of the absence of adequate safety facilities. Indeed, fellow drivers Graham Hill and Bob Bondurant were the EMT Unit that day and came to Stewart's rescue, using a hacksaw from a spectator's tool box to saw through the BRM's steering wheel to free Stewart. It was this episode that ultimately led Stewart to become the champion of prodding track owners, promoters and the sporting authorities alike to improve the overall safety of the tracks used in Formula One. Like the 1996 Monaco race, where only four cars were classified as finishers (3 of them BRM's), Spa 1966 was also short of finishers. After the deluge, only 7 cars were left and by the end only the Ferrari of Surtees and Rindt's Cooper-Maserati were on the lead lap. To his credit, Dan Gurney, in his Eagle-Climax, was still running and finished 7th in this first race for his Eagle, albeit 5 laps down. Squeezed in between Monaco on May 22nd 1966 (where Clark flubbed the start but then climbed back from 16th position and was challenging for third before his suspension broke) and Spa on June 12th 1966, was the 1966 Indy 500, held on Monday, May 30th 1966. The Grand Prix contingent was out in full force, but with some changes in the makeup of the drivers and teams. Lotus and Ford had parted ways and STP was substituted as the main sponsor of the Lotus team, which meant a change of color from British Racing Green to STP's trademark Day-Glo red, "Granatelli Green" as Colin Chapman called it. Dan Gurney was no longer with Lotus; instead, he entered the Indianapolis version of his Eagle-Ford for the 1966 Indy 500. Clark's new teammate was the driver we know as Al Unser Sr., then 26 years old and a rookie the previous year at Indy. Although the Indy STP Lotus 38 was originally designed for the infamous BRM H16 that Chapman wanted to use, Lotus ultimately went with a Ford engine. BRM's engine may not have made it to the Brickyard but its Formula One team did: Grand Prix BRM teammates Graham Hill and Jackie Stewart again found themselves on the same team, driving the American Red Ball and the Bowes Seal Fast Lola-Ford Special's for Texan John Mecom, Jr. Both Stewart and Hill were on a roll, having finished first and third for BRM at Monaco just eight days before the 1966 Indy 500. For the Formula One contingent, the 1966 Indy 500 presaged the first lap deluge/disaster that was to happen at Spa on June 12th 1966, only this time it was a garden variety chain reaction pileup and not rain that decimated the field and brought out the red flag. When the debris was cleared away, 11 of the 33 starters were out, including Foyt and Gurney, both of whom got caught up in the accident. Foyt was one of the few injuries, having cut his hand when he climbed the catch fencing on the main straightaway to get away from the spinning cars. Gurney, for whom 1966 must have been a pressure cooker atmosphere running cars on both sides of the Atlantic was not hurt physically but was wounded inside, and he bemoaned the amateurish behavior of some of the drivers: "Collectively, I don't know really who is to blame ... but they're all using very, very poor judgment. It's not very difficult to drive down a little straight piece of track here with a few cars around ... It shouldn't be any trouble at all ... We are supposed to be good drivers and ... I don't think they have the judgment of a flea for all I am concerned." 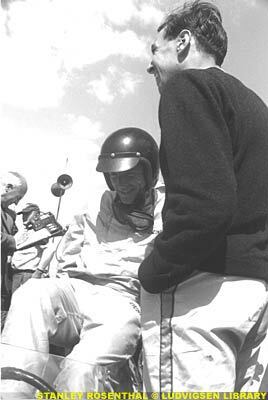 Although Gurney's personal Eagle was out of the race, All American Racers still had several Eagles in the race, one of them in the hands of Lloyd Ruby who led by a lap at one point until an oil leak from his Ford engine led to a long pit stop. Clark had qualified in the middle of the front row (next to Mario Andretti who was on pole) and had an eventful race. For ease in identification, on the left side of Clark's Lotus, STP had added whitewall Firestone tires to go along with the already garish paint scheme. The whitewalls looked spectacular when Clark spun the car during the race, which he did twice, each time avoiding hitting anyone, no mean feat at the Speedway. Indeed, on one occasion, while in the lead, Clark spun in Turn 3 and did three pirouettes, which Clark somehow controlled. Pictures of the episode show the car sideways on the track, smoke pouring off all four Firestone tires while Jimmy calmly looked down the short chute between Turns 3 and 4 , his face covered by tape up to his goggles, working out in his mind how to set things right, which he did. Later Jimmy was reported to have said: "I actually spun six times but caught four of them," quipping that STP would now stand for "Spinning Takes Practice." The crowd was awed by the car control and sheer talent Clark showed that day. Meanwhile, Jackie Stewart was doing his share to add to the excitement of the race and his performance that day endeared him to American race fans for his entire career, first as a racer and then as a commentator for ABC Sports after he retired from driving. By lap 162 or so of the 200 lap race, the order was three Formula One Brits in three British cars: rookie Jackie Stewart's Lola-Ford in the lead, Clark's Lotus-Ford second and Hill in third in another Lola-Ford, running close to one another in a field of only 10 surviving cars. But it was Stewart who was becoming the darling of the crowd as he steadily built his lead by more than a lap when suddenly his Ford V8 lost oil pressure with only 10 laps and 25 miles to go, and Stewart coasted to a halt on the grass in Indy Turn 4. Stewart got out of the car and pushed it out of the way as they do in Grand Prix circles and proceeded to walk all the way back to the pits, cheered thunderously by the appreciative crowd along the way. Back on the track, confusion over the running order reigned. The official timing and scoring group thought Stewart's teammate Graham Hill was in first place; the Lotus lap charts had Clark in second behind Stewart - spins and all - and the team thought Jimmy was now in the lead and reported that to Clark by pit board. As the ten remaining laps ticked down, it all ended quickly and Graham Hill took the checkered flag and drove directly to Victory Circle. In typical Clark fashion, although he thought he had won the race, he stopped en route to Victory Circle to commiserate with fellow Scot Jackie Stewart and by the time Clark got to the rostrum, Hill had already gulped down the ceremonial bottle of milk and was enjoying his victory. Clark got out of his car, which was parked near the rostrum, and went over to congratulate his old friend. It remains somewhat of a mystery as to whether the official timing charts or the Lotus lap charts were correct. Colin Chapman checked the official scorer's records and seemed willing to admit that he may have been in error. But STP's Andy Granatelli could never quite reconcile himself to losing the race in this way, when there were only a few cars running at the end and said later in exasperation: "How can we put men on the moon and yet be unable to track one little old race car?" Back in Europe, the 1966 season belonged to the Brabham Team and the light, Repco/GM-based engine, with Brabham winning the French, the British, Dutch and German Grands Prix, as a dispute between Surtees and Enzo Ferrari that related to driving Ferrari sports cars short-circuited Ferrari in mid-season. Ferrari did win its home Grand Prix at Monza on September 4th 1966, in a 1, 2 finish, with Italian Ludovico Scarfiotti ahead of Englishman engineer Mike Parkes by 4 seconds, per team orders. And Lotus salvaged its dignity (and BRM's) with Clark's victory at Watkins Glen in the Lotus 43 with the BRM H16 engine, of which so much was expected in both Grand Prix racing and at Indy but which ultimately delivered only this one Championship win. Surtees, having switched from Ferrari to Cooper-Maserati mid-season won the Mexican Grand Prix on October 25th 1966, finishing just ahead of the Drivers' and Constructor's Champion Jack Brabham and his teammate Denis Hulme. Previously: Part I | Part II | Part III Next Week: 1965 and 1966.